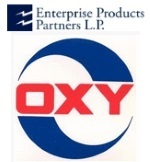 Enterprise Products Partners L.P. (NYSE:EPD) announced that operations have begun at a new cryogenic natural gas processing plant in Reeves County, Texas jointly developed with an affiliate of Occidental Petroleum Corporation (NYSE:OXY). The plant is owned by Delaware Basin Gas Processing LLC (“DBGP”), a company in which Enterprise and Occidental each hold a 50-percent interest. Enterprise will serve as the operator of the new facility. The new DBGP plant has a capacity of 150 million cubic feet per day (“MMcf/d”) and can extract in excess of 22,000 barrels per day of natural gas liquids (“NGL”). Supported by long-term contracts, the plant is designed to accommodate the growing production of NGL-rich natural gas from the Delaware Basin. In conjunction with the DBGP plant, Enterprise has completed construction of an 82-mile, 12-inch diameter NGL pipeline that connects to its Chaparral Pipeline, providing customers with access to the company’s fractionation and storage complex in Mont Belvieu, Texas. The partnership’s Texas Intrastate pipeline system will provide natural gas transportation services at the tailgate of the plant with access to multiple markets.